This year’s crop of famous — and some might say infamous — Jersey corn is still only about waist-high, but those fledgling stalks already have me dreaming of all things corn. We probably have another month to wait until the early ears hit the farmer’s markets and I’m counting down the days. Same with summer’s bounty of cherry tomatoes. And even though I know I’ll be rewarded if I wait it out, I couldn’t help picking up a pint of grape tomatoes at the grocery store recently to roast with the ultra-convenient frozen corn we nearly always have on hand. Corn — or maize, as it’s known in many countries — is an ancient grain which is believed to have originated in Mexico. It quickly spread along trade routes into the Americas and Europe — and beyond — due largely to its ability to thrive in extremely diverse climates. The Americas are still responsible for the majority of corn production, both the sweet corn that we prefer to eat and the feed corn that is grown for livestock. Since I’m a believer, as I’ve said before, in the maxim that “things that grow together go together,” it’s little wonder that we’ve paired tomatoes with corn in this dish. Tomatoes, too, originated in Mexico and followed similar exploration and trade routes to become the world-wide crop they are today. This dish qualifies as super simple — a side that comes together so quickly you hardly have to think about it. It’s succotash’s more kid-friendly cousin (nary a lima bean in sight), roasted in the oven to give it a sweeter, slightly more smoky flavor. It’s vegetarian, vegan, and one of those dishes where the quality of the produce really stands out. For those of you concerned about genetically modified ingredients, seek out non-GMO corn and tomatoes and make sure your olive oil is non-GMO too. In my opinion, purchasing produce that hasn’t had its genes played around with means you’ll get the real deal — juicer tomatoes, cornier corn (though perhaps a bit less sweet, but more flavorful! ), and olive oil that tastes like the olives from which it was pressed. Isn’t this a pretty dish to set before…well…anyone? 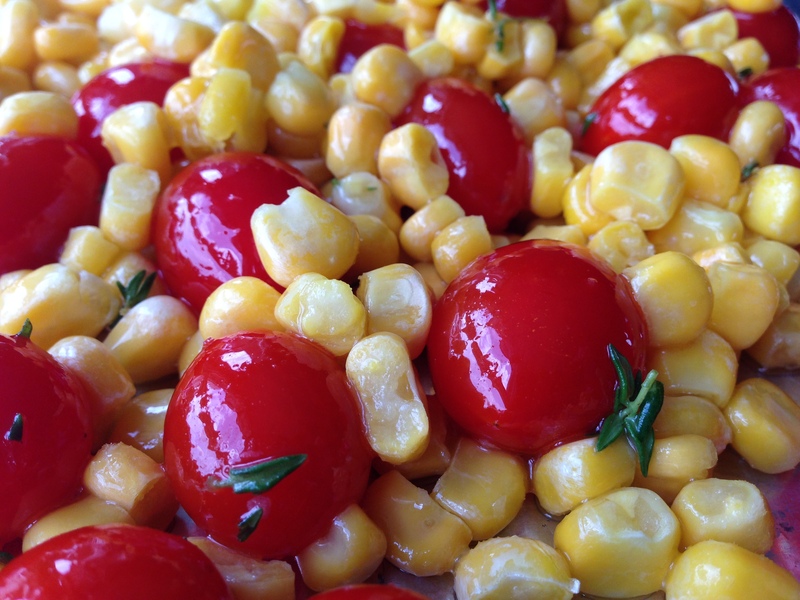 Roasted corn and tomatoes with basil. As easy as this dish is, The Stout Sprouts found plenty to help with in the kitchen. 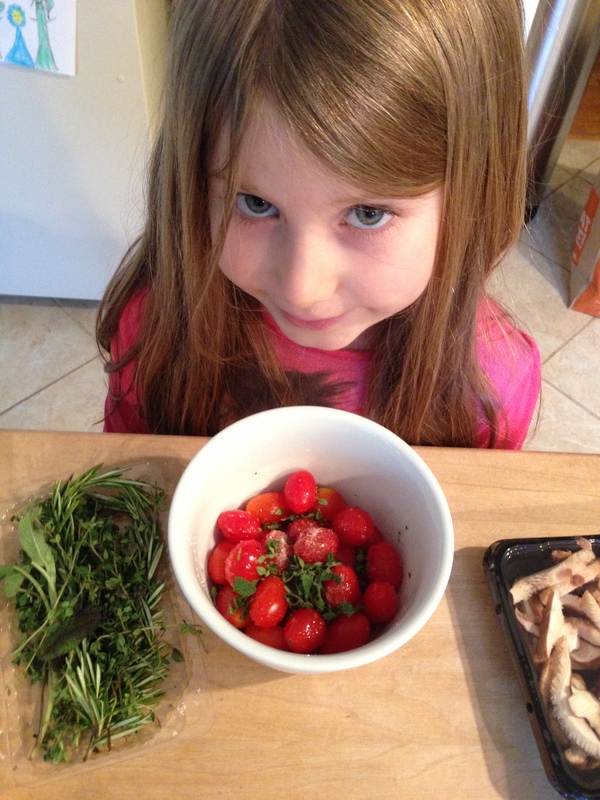 Daughter 1 helped pick thyme leaves off their stalks and Daughter 2 helped toss the corn and tomatoes with the oil, salt and herbs. I, as always, was on oven duty and did the fine chopping of the basil. If you’re looking for variations on this dish I highly recommend corn cut fresh from the ear. That’s what we’ll be having in about a month. Another great version is to let the finished dish cool a bit, and then sprinkle on some crumbled feta cheese (not vegan, but still vegetarian). I try to work around the thyme leaves in the portions I serve our Sprouts, and neither of them really like the final flourish of fresh basil so I leave that off their dishes as well. Roasted Corn and Tomatoes with Basil is great on either weekends or weeknights and complements just about any other dish you may be serving: sliced steak, grilled chicken, seared scallops, or even a fried egg (talk about an easy dinner!). I hope you’ll give it a try, and even do some variations of your own. Let me know how it goes! 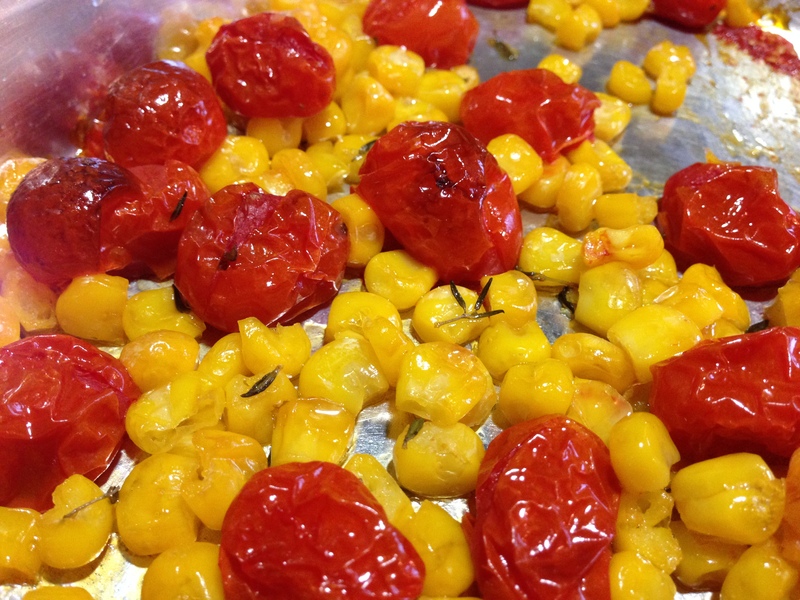 Place your oven rack in the middle lower position in the oven and preheat oven to 400 degrees F.
In a small mixing bowl, combine the whole cherry tomatoes, corn kernels, olive oil, salt, and thyme. Place mixture on a baking sheet and bake for 20 minutes. Stir, and bake for another 10 – 15 minutes, until some of the corn kernels have begun to caramelize around the edges and the tomatoes are quite soft but haven’t yet burst (though they are still great if they do). Remove the baking sheet from the oven and allow to cool until the vegetables are warm but not hot. Sprinkle on the shredded basil and serve with additional salt and freshly-ground black pepper. Kid rating: three and a half stars. We’ve made this several times so far this season. The first time the kids really liked it. The second time, Daughter 2 went on an all out hunt for thyme leaves, pushing each and every one to the side of her plate. The third time, she decided she vastly preferred fresh cherry tomatoes to cooked ones. And, neither daughter wanted any basil, either of the times this was served. Net net: this may be a winner dish or a loser dish on any given night, based on the whim of the children. Keep at it, though. This is too easy and too tasty to pass over. And don’t be afraid to substitute herbs the kids like for ones they don’t…or just go with salt and pepper if those are the only seasonings on your sprout’s approved list. This dish is also great with crumbled feta cheese or a sprinkling of whatever cheese your kids like. I wouldn’t pass up some crumbled bacon sprinkled on top, either! Parent rating: four stars. I like the way the tomatoes cook down in this easy side dish, becoming sweeter and more concentrated. 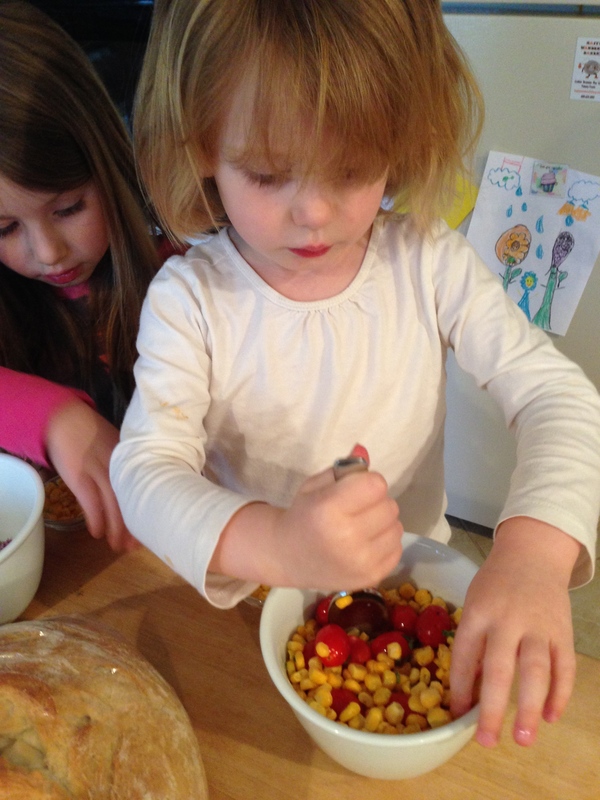 The little bit of tomato juice that leaks out into the corn creates a wonderful sauce of sorts. The basil really elevates this simple dish. 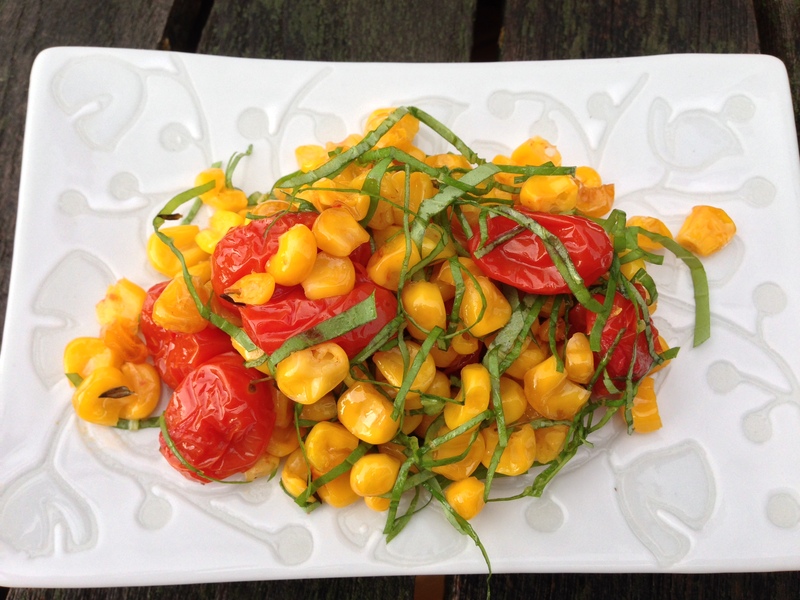 If you can make it with ultra-fresh corn, tomatoes and basil, I think you’ll be extremely pleased with the results.